I just want to thank you and your company for handling my case in a very professional way. You communicated very well, asked the right questions and came up with a fair and just offer for me and the transmission shop. My Volvo is now repaired by Mitchell Transmission in Newburgh, IN and works perfectly. I would like to know where I can post my positive experience with CARS Protection [Plus} in order to advise others to use your extended service contracts. It feels good to know there are people that really take pride and concern with their job and don't try to scam others (that is always my fear as a female). But he was very professional and assured me things would be okay. It's like I told the mechanic. It's hard to build a trust in a service… like finding a good barber or hair stylist you always want to go back too! Thank you. I appreciate the warmth and kindness. We are a new and used car franchise located in Kansas, and have been using CARS extended service contract programs successfully for a number of years. The variety of programs offered fit a wide range of customer needs, not to mention there are options to fit just about any customer's budget! Preferred Used Cars has been selling cars for over 20 years in the greater Cincinnati area. We have dealt with several different service contract providers throughout the years. CARS Protection Plus hands down offers the most coverage for the best price. We also have a full time service shop as part of our dealership. CARS Protection Plus always settles claims quickly and fairly. They will locate the parts for you if needed. They pay their claims within days of receiving a completed service bill without hassle. Thank you. 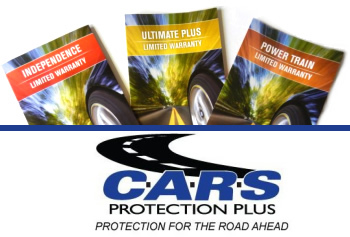 We have been using CARS Protection Plus service contracts for over 7 years with complete satisfaction! From the basic Power Train, to the four-year unlimited miles service contract, CARS provides the coverage you want for the price you can afford. Peace of mind is PRICELESS! In the 8 years that Discount Auto Sales Inc. has been selling CARS service contracts, we have sold numerous service contracts to our customers as well as provided service contracts with our used car sales. We haven't had any problems or complaints with these service contract sales. As a matter of fact, most of our customers who get a 3 month service contract usually purchase an extended service contract at the end of their 3 months. The staff at CARS has also been easy to work with when we do have a claim, and very personable when talking with them on the phone when there is a question on the service contract. I just wanted to drop you a line and let you know I enjoy selling CARS service contracts. I have heard good things from my customers. If you have any questions please feel free to contact me. Thank you for the excellent customer service today on the phone. I must say… that was one of my best customer service experiences I have ever experienced in a long time. Kudos to you and your company! Have a great day! You are MARVELOUS....thank you so very much for your wonderful customer service, above and beyond the call of duty. Please let your supervisor see this so you will get a HUGE raise. I really don't know what I would have done without your assistance today. Again, my thanks! Just a quick thanks for your help today. You guys always make it easy and are good on the phone. Look forward to doing business again. Have a great weekend! Just wanted to touch base with you and let you know that we thank you all for all that you guys do. We have been using CARS service contract for many years. To be able to offer a service contract on used cars helps give the consumer and the seller peace of mind. My name is Dan, we own a used car lot in our home town and have been using your service contract since we have opened. We like your service contract because of the peace of mind it gives us and our customers. Keep it going and thanks to Tom our representative, he's always a phone call away. CARS service contract is a great company to deal with. I would like to express my gratitude for the courtesy extended to me, by your service writer Bill, in coordinating my service contract with your work performed on my Oldsmobile van on 1/18/2011. I will have no problem recommending your business to my friends. Thank you. Chris, I thank you for getting me that letter so quickly, I really appreciate it. I hope my vehicle does not have an issue in the future, but if it does, I am satisfied with your company's service, customer service, and timeliness. Thank you again so much. Thank you for being our service contract company, you are very positive to work with. This is the best company I’ve ever dealt with. Other companies I’ve dealt with are a pain, but CARS handled everything well. It's a pleasure working with CARS, no hassles and very straight forward. AATCO Transmission Service would be happy to work with CARS to better serve your customers transmission and/or drive train repairs. We are happy to be able to efficiently serve the customer and help to establish a great working relationship with your company. We are here to work with you to fulfill the needs of the repair and help in working with the customer to get them back on the road as quickly and cost efficient as possible. We look forward to working with you in the near future.